Tank less water heater: So you’re tired of running out of hot water in the shower and want to replace that old hot water heater. Or maybe you’re considering a tank less water heater for a new project. 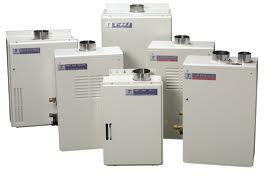 Well a tank less water heater can be a great solution to your residential hot water needs. They’re also referred to as on demand hot water heaters because they don’t usually store hot water, but rather create it on demand. And installing a tank less water heater can qualify you for a federal energy tax credit! But for all the hype surrounding these appliances there are some limitations and trade-offs to consider before you can really decide if the tank less water heater is for you. I have one in my house and properly used these appliances are absolutely great. Improperly used they are disappointing and expensive. They come in point-of-use and whole-house versions and there is a electric tank less water heater and natural gas or propane models. Some tank less water heater units are sized to heat a cup of tea, others to provide enough hot water for 2 or more bathrooms. Also, the region of the country you live in has a lot to do with how much hot water a tank less water heater can produce. There are a lot of factors to consider with these units so I’ll lay out what you need to know about the tank less water heater so you can make an informed decision before you get, well, into hot water. 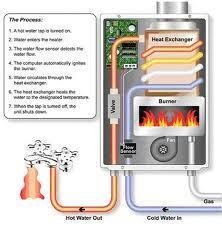 The tank less water heater works by directly heating water on demand, as it is required. Unlike traditional hot water heaters using a storage tank, a tank less water heater has no storage tank and thereby have no standby heat loss. Standby heat loss is the heat lost and energy wasted by heating water only to store it in a tank and is characteristic of traditional hot water heaters. Avoiding standby heat loss is primarily how a tank less water heater makes the claim of being energy efficient. There are three variables that have to be considered in sizing a Tank less water heater. The desired temperature of the hot water exiting the unit.Those three factors, as you will see later in this tutorial, are what determine the type, size and possibly even the quantity of tank less water heater you may need. Whole house units mean that they have higher GPM flow rate capacity and can handle demand for more than one fixture at a time. For example a unit may handle two shower fixtures at one time or a dishwasher, kitchen sink and lavatory hot water faucet at one time. Why the different number of fixtures? Because different fixtures use different amounts of water. 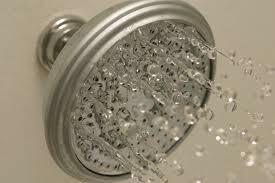 Some shower heads can use six times more water than a bathroom lavatory faucet. So the size and number of whole house tank less water heater you need will be largely driven by flow rate and that is determined by the number and types of fixtures you may have running at one time. And the worst culprits are shower heads. That’s why you may need more than one whole house tank less water heater hooked up in parallel to meet your hot water demands, especially for simultaneous shower usage.Whole house units are much more expensive than point of use units and cost from several hundred to several thousand dollars (without installation). Pre-1992 Faucet: 4.0 – 8.0 GPM As you can see, older pre-1992 faucets and shower heads can require very large water flow. So to accurately size your water heater, you need to measure the actual water flow from your faucets and shower heads which is outlined in this quick tip Quickly Determining GPM Flow Rate.I really recommend you go through that simple exercise for bathroom faucet, shower head and kitchen sink faucets, even relatively new ones. Since the Federal Energy Policy Act of 1992 is not heavily monitored, there have been problems with faucets exceeding their stated 2.2 GPM ratings. If that’s the case, you need to know before you size and install your tank less water heater. A Tank less water heater is often referred to as, “on-demand water heating,” because it does not store heated water. Once the faucet is opened, water flows into the heater where a sensor turns on the heat exchanger or heating coils. Water flows through the heating coils, it is heated to the desired temperature. Once the faucet is closed, the sensor automatically shuts down the heating coils. The entire process takes about 5 seconds to heat the water initially. We have seen that since there is no standby loss, a tank less heater can be more energy efficient than their counterparts. 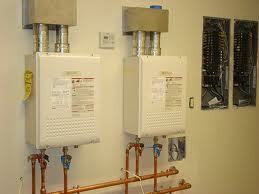 Other advantages of a tank less water heater are that they do not waste water since water is heated almost immediately. Also, you will not run out of hot water in the middle of a shower. Since tank less heater are smaller and do not hold water, their life span is 20 years, twice its counterpart’s. A Tank less water heater has its drawbacks as well. If using a gas heater, keeping the pilot light continuously lit may reduce its efficiency. Also, smaller units may not work as well when washing clothes or dishes and taking a shower at the same time. 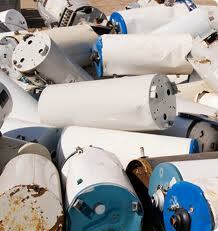 Lastly, the initial cost of a tank less heater is more than a conventional tank storage heater. ive installed hudrdens of these and depending if you are on a well or public water system there is a difference public pressure coming in is to high youll have to install a valve in order to cut back pressure going in the heater or you just wont have enough hot water ,and if you have more than 1 story with bath on 2nd story you just wont have enough pressure at the 2nd story , but overall if your using on 1st floor on a well system they work great.